As of yesterday evening, in Patch 6.2 PTR build 20033, Blizzard has "fixed" some of the problems the tier set bonuses were having. I have to say fixed a bit tongue and cheek because, for BM hunters, while our 4 piece bonus was fixed in the sense that it wasn't doing anything before, but now it is; it's also broke in the sense that it's insanely overpowered. Even though I fully expect the nerf-bat to hit these set bonuses in a pretty big way before 6.2 goes live, I thought I'd go over some of my results from testing this evening, just for fun. (2) Set (Beast Mastery): Arcane Shot and Multi-Shot increase the duration of your Focus Fire by 3 sec. Blizzard continues their emphasis on Focus Fire mechanics in 6.2 with this set bonus. Remember that Focus Fire, when used with 5 stacks of Frenzy includes a 40% Attack Power buff. With this new mechanic, as soon as you get to 5 stacks of Frenzy the first time, you're basically guaranteed to have that 40% AP buff for the rest of the fight, unless you have just terrible RNG. Given that you'll generally spam a lot of Arcane Shots during Bestial Wrath, it's not too hard to average one Arcane every 3 secs. It becomes even easier to maintain with a little manipulation of talents. As a slight disclaimer, I haven't tested BM in 6.2 with all of the Talents, and haven't really run any simulations yet; so I'm not trying to say these are the best talents to choose. The easiest option we have is to take Thrill of the Hunt with Powershot. The primary benefit of Thrill of the Hunt is not only can you keep Focus Fire up nearly 100% of the time, but you'll rarely, if ever have to refresh it. In the parse shown above, I had 4 minutes and 28 seconds (out of a 5 minute, 34 second fight) with 5 stacks of frenzy on my pet. Over the course of the fight, the extra 20% attack speed for four and a half minutes means an extra 53 Pet Melees. 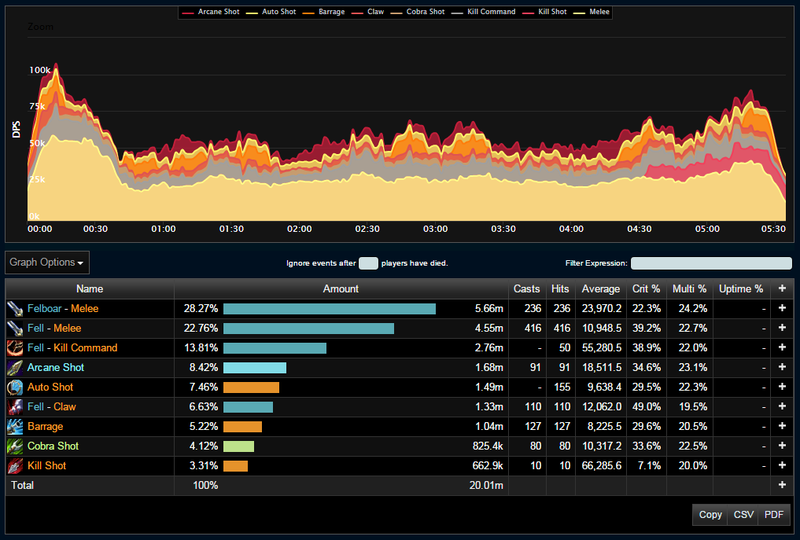 That's a 324,816 damage increase * (compared to not having Frenzy stacks) in the gear I was wearing in the above parse. The primary benefit of Powershot in this situation, is with its low Focus cost, and high CD, it just doesn't get in the way of casting Arcanes, extending your FF and Frenzy up-times. There may be a way, with good focus management, to maintain the 100% up-time on Focus Fire, and still good up-time on Frenzy, while taking Steady Focus or Dire Beast. However, it looks like it's going to be a bit less reliable, so if you have some bad RNG, you might lose a significant amount of Focus Fire, or simply have to refresh it too often, losing out on the Frenzy attack speed buff for your pet. If, however, you were able to keep up both Steady Focus and FF, you'll certainly end up ahead, as you'll be seeing a lot more Wild Hunt procs from your pet, which will of course be even more beneficial with the extra AP from FF. Dire Beast tends to be in the same position, where if you can use it, and keep Focus Fire up, you'll see even more damage out of your Dire Beast. I don't yet have enough data to really guess at whether it will be worth the more difficult rotation for Steady Focus or Dire Beast, but I'd be surprised if some of the more skilled hunters don't find a way to get a lot of DPS out of those talents. As for the GT/PS/Barrage talent tier, Barrage is still a good choice for BM hunters, but it does take away a lot of focus and casting time from Arcane Shots. It may end up having a similar rotational impact as SF/DB, in that if you can manage your focus well enough to keep up Steady Focus 100% of the time, while using Barrage, you'll be DPS ahead. But if you have some bad RNG, or use Barrage at the wrong time, and then can't refresh Steady Focus, you'll end up losing out on a lot of DPS. Unfortunately, because of the refresh rate on auras, you won't be able to macro it to Focus Fire, as adding /cast Focus Fire underneath won't allow enough time for the server to recognize that the previous Focus Fire was canceled before checking to see if it can cast the new Focus Fire. If you use it seperately, though, you can use your cancelaura macro during your previous ability's GCD, then cast your new Focus Fire during the new GCD, which will keep you from losing any time. (4) Set (Beast Mastery): Your Focus Fire effect also summons a Fel Boar to assist you. The Fel Boar lasts for the duration of Focus Fire. **Edit** Some of these mechanics have been changed since I wrote this article, as is the nature of the PTR. If you're looking at this article from a future date (was published on the 20th of May, 2015) please look for updated information regarding the Fel Boar's mechanics. If you look at the top Damage line in the image above, that's the damage from my new Fel Boar. To be sure we're understanding each other, that's 17k dps over the course of a fight where I did about 60k dps total: almost 30% of my total damage. When I first opened my logs, well, it was unexpected to say the least. As I mentioned above, I'm expecting this will be nerfed before it goes live, but as of now, this makes keeping up the Fel Boar our number one priority. Fortunately, keeping up the Fel Boar is the same thing as keeping up Focus Fire. Which means all that work we're going to do when we get our 2 piece set bonus, it's going to pay off double by the time we get our 4 piece. The vast majority of BM hunters are already doing this on the pull, but now there will be no time when it isn't worth it to cast focus fire, if you have even 1 stack of frenzy. After delving even deeper into the logs, it turns out that your Fel Boar will do the exact same damage regardless of how many stacks of Frenzy you consume when casting Focus Fire. That is to say, it does not benefit from the Focus Fire AP buff. It does, however, benefit from any other increases to your Agility or secondary stats. Fortunately, you'll only have to make that decision on the pull, as you should almost always have both Focus Fire up and 5 stacks of Frenzy. On the pull, we'll continue to use Focus Fire as soon as possible, to consume that first stack of Frenzy, and get our Fel Boar out as quickly as we can. Of course, as soon as you get to 5 Frenzy stacks again, you'll want to cancel the weaker Focus Fire and reapply to get the full benefit. Other than doing an obscene amount of damage, there's not much to say about the Fel Boar. I like the idea of having more large pets on the boss, just to mess with Melee. Other than that, I didn't really see it much, other than when it spawned (it spawns at your side, then charges toward the boss). Without some major nerfs, BM is currently head and shoulders above the other two hunter specs, in both Single Target and AoE. Even if the 4 piece Fel Boar is nerfed a bit, BM will most likely stay the top single target spec, as it's a lot easier to perfect the rotation than MM, and comes with no movement penalties. If you haven't jumped ship from SV/MM yet in 6.1, if you want to raid in 6.2, you'll almost certainly be needing to head to BM (with, of course, the usual disclaimer about this is PTR and anything can change). Last expansion focus fire was so useless that when leveling one of my 90 hunters that was BM I noticed I did not even have it on my bar. We are not talking not bound, we are talking not even on my bar at all. I had to add it. I am not liking BM thus far but that is because that hunter just hit 100 and has no gear what so ever. Might change with gear. Poor pet is so squishy. Feels stronger as MM and SV when I first hit 100. Did you notice that as well? As BM I find myself rolling mend pet all the time but as MM and SV I rarely if ever need to heal my pet. Working as intended? I haven't seen the pet issue. I levelled my first hunter as MM, and my second as BM, and I can't remember what I levelled my horde hunter as.. Maybe SV, maybe BM. Didn't notice any difference with the pets. And I started farming for blood spirits on all three as soon as they hit 100. I definitely had to use Mend Pet on all the elites over in North Nagrand. but I can't remember if one hunter's pet felt squishier than others. If you're up for the challenge, I tried using DB and Barrage, and it you definitely end up making some interesting decisions. I'm unsure of what will turn out to be the best DPS option, but maybe for those who are really good at BM trying to balance SF and good up-time on the 2 piece will be fun. SimC is being updated as we speak, so we should have more data to play with soon. Yeah, I'm definitely going to try SF out. I like having it up going into BW.